Reason: For championing non-sectarian tolerance. Now what we in the mainland euphemistically referred to as ‘The Troubles’ are over (ish), Northern Ireland rarely gets a look-in in UK politics. That changed this week, though, when Alliance Party MLA Anna Lo dramatically announced she was quitting politics – and possibly leaving the country she’s made her home for the past three decades – following comments made by First Minister Peter Robinson in support of a controversial pastor who denounced Islam. I make no apologies for highlighting that Alliance is a party which champions and cherishes diversity. What saddens me is that the focus on my comments reflects that there are those, with their orange and green lenses, who are incapable of seeing beyond sectarianism. They either can’t grasp the concept of a cross-community party, or they won’t, because cross-community politics threatens their position. Tackling that narrow-mindedness is this party’s responsibility. But it is also our privilege – as a forward thinking and progressive party we will have the privilege of delivering Northern Ireland from the shadows of the past and showing the world all we have to be proud of. 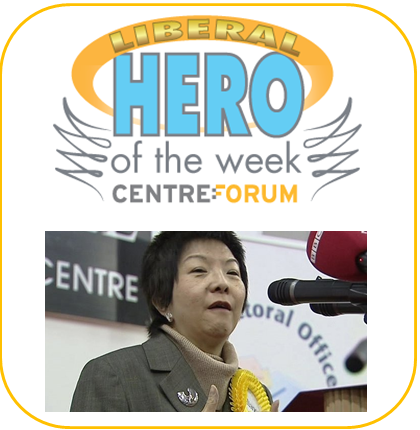 For her courage and determination, in taking a positive stand by trying to unite people, Anna Lo is a Liberal Hero. Theresa May (Home Secretary): for her courageous speech to the Police Federation bluntly setting out the reforms it needs to make in order to regain public trust. Mark Carney (Bank of England governor): for warning of the dangers to the British economy of our failure to build enough houses and the likely need to scale back the Coalition’s Help to Buy scheme that’s further stoking the market. Eric Schmidt (Google’s executive chairman): for highlighting the risks that the European Court of Justice’s ‘right to be forgotten’ ruling will harm the public’s right to know, with public figures seeking to restrict access to publicly available information.